Love it or hate it, for better or worse, Microsoft Word (and the DOC format) is pretty much standard when it comes to writing on a PC. Ubiquitous, even. That's exactly why we're so excited about Writing Outliner for MS Word. It's an add-in that takes Microsoft's industry standard word-processing platform and supercharges it with a host of tools designed specifically for large-scale writing projects. In a nutshell, Writing Outliner allows you to treat individual sections of a large project as smaller separate documents. This project-based method of writing is ideal for any complex document. For example, novels, research papers, technical white-papers, a series of columns, a short-story collection, or even a personal diary! The hierarchical outliner is probably the most important and powerful aspect of Writing Outliner. It faciliatates better, more intuitive organization of notes and thoughts, offers a big-picture overview, and allows for much easier navigation of long texts. But that's only the beginning! Writing Outliner also features lightning-fast full-text search, tabbed document editing, Outlook-style document status flags and icons, custom document tagging, a comprehensive document synopsis and notes system, and much, much more. Make sure to click over to the Writing Outliner website for a thorough overview! Writing Outliner also includes a fantastic feature called the Corkboard View! 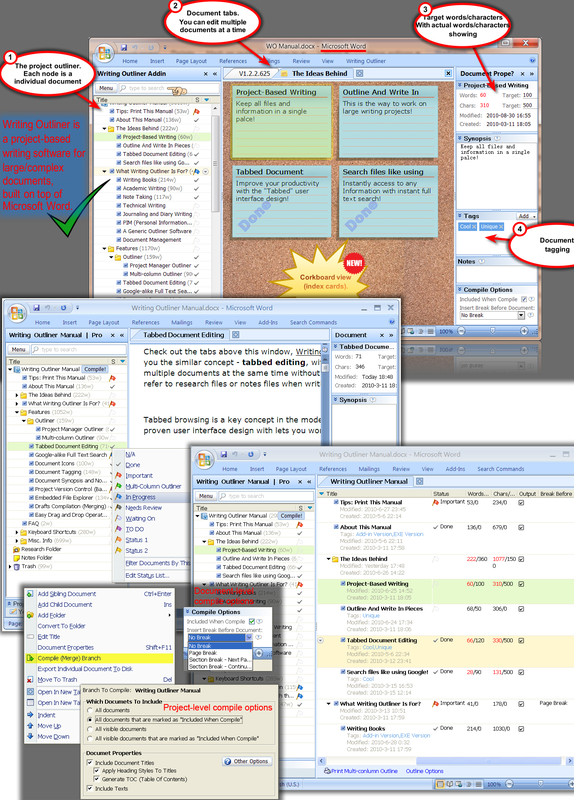 The Corkboard is a fantastic tool for plotting a novel, or providing a visial overview of the entirety or parts of your project. Want to see the Corkboard in action? Take a look at the brief video demo. Export complete project data (both the MS Word documents and metadata) to avoid vendor lock-in worry. Copy, cut, and paste documents within a project. Transform Word into a much more powerful utility optimized for large scale, complex writing projects. Manage and write sections of your long writing projects as though they were discrete documents. View a document as a Multi-Column Outline with meta data displayed, including titles, synopsis, notes, status icon, label icon, tags, word count, target word count, and so on. Utilize tabbed-editing for much faster navigation between documents. Organize your documents with customizable Document Status Icons and Document Label Icons. Attach customizable text tags to draft documents. Write synopses and notes for each draft document. Access a backup and restore feature allows you to manually or automatically (upon closing a project) backup your whole writing project. Revert to any of the old revisions at a future time! Navigate your files from within Writing Outliner with a full-featured Windows Explorer component. Merge separate draft documents into a single long document for output. Get a visual overview of your project with the new Corkboard feature. After you purchase Writing Outliner for MS Word it may be used indefinitely. Writing Outliner for MS Word is licensed per user, so if more people are going to use Writing Outliner for MS Word you will need to purchase additional copies. “It is an indispensable writing tool for Word!Writers can over-come so-called "writer's block" by carefully outlining and researching their writing projects. That's why I think Writing Outliner is a dream come true for writers. It enables us to easily create and organize material in ways that enhance writing quality and speed the writing process. I use Writing Outliner every day and think it is an indispensable writing tool for Word.”- Donald L. Hughes, CEO Theatron Media Group., Inc.
“It allows for much better organization of thoughts, resources.I've been using Writing Outliner for a few days now. First, for a beta product, it's remarkably bug-free. Second, I get it, I really get it! It's a nice tool, it allows for much better organization of thoughts, resources, and subdocuments than Word does.... And third, it works with EndNote, which is very important to me.”- Mitchell L. Silverman, J.D., M.S., legal reference and emerging technologies librarian. A great product. I appreciate the updates. I purchased two licenses for Writing Outliner, one for me in July.2011 and one for my wife in Aug.2013. My wife loves it, as she is writing her thesis. 1. Can I update both of my licenses for free, to get the latest version? 2. Can I copy a project from my computer to my wife's computer? If so, how to best do that? 3. How many of my own personal computers can I install Writing Outliner on? Edwin Yip @Petr, 1. In general you can get the updates in one year, but as of now, yes; 2. Just copy the .woprj files over your computers; 3. Three. i stop using it on 2012 because It did not save my final copy several times. Can I update without charge? It was a great program when it saved my texts. Sorry for the problems. Whenever an new major upgrade is released, I send newsletters, but usually over a half will not open the email, so I'm not sure if you missed any news. Please send email to support writingoutliner.com to discuss this issue. Thanks. Steven Schulman I see that the product is $49 on the Website. It says here that there is an additonal $20 savings, but when I click on the Get This Deal button it says $51.35. I am reluctant to enter my credit card and the buy it until I see the price as being what I will be charged. How do I handle this? Thanks. Constantin Florea @Steven Schulman - I am sorry about the issue. The phrase mentioning the additional $20 saving was used during the last 2 days promotion which ran in August 2013. I am sorry but at the moment, we cannot bring a higher discount over the existing $49.00 price. Steven Schulman Thank you. I thought this was a current offer. Ela S. Excellent product and excellent developer. In the meantime, I know that the latest version runs with Word 2013 as well. So far with 32-bit only - pls let us know when it will work with 64-bit as well. Paul User I recently purchased this software in November 2018 and installed it however, it doesn't show up in MS Word, I never get the "welcome pane" and there is no tab so I cannot use it. Constantin Florea @Paul User, I've just contacted the vendor regarding the issue you mention. Paul User @Constantin Florea; thank you for reaching out to the vendor for me. Have they replied to you yet? If they have, what was their response? Paul User I already sent them a message before I posted here. Lose the Ribbon for good!